WW1 Reenactments Equipment : Great War Tommy WW1 Documents, Paperwork : Precautions against Trench Foot. WW1 Reproductions and WW1 Reenactors Equipment / Kit - Precautions against Trench Foot. 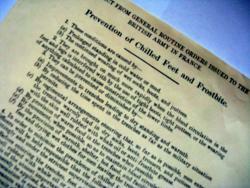 Army form B11764 (Jan' 1916) Extract of General Routine Orders detailing prevention of Chilled Feet and Frostbite (the dreaded "Trench Foot") in the trenches, by using long gum boots, whale oil, anti-frostbite grease, etc.